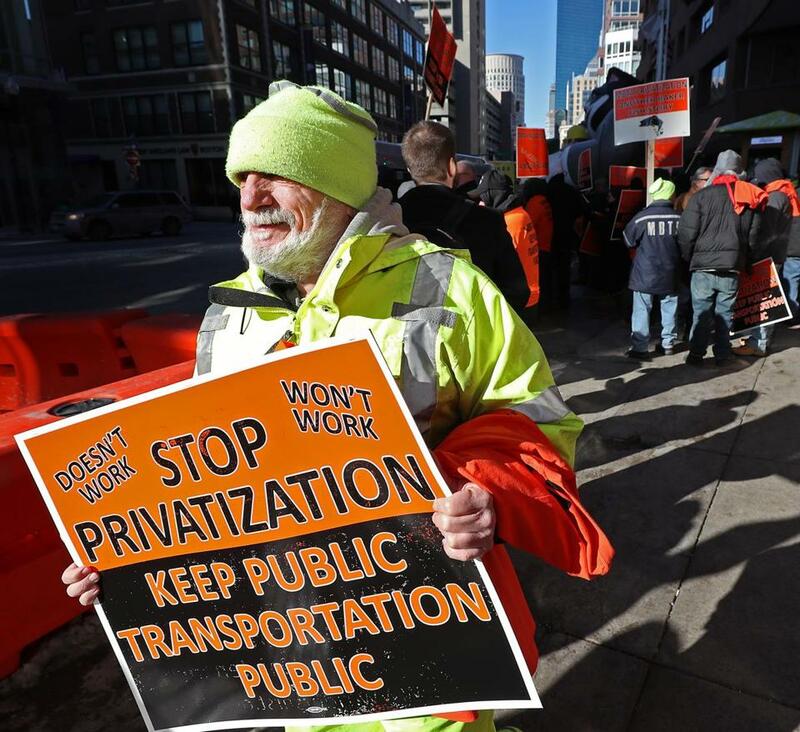 MBTA mechanics protested efforts to privatize the agency Monday. The T says it could save $27.6 million by privatizing some bus garages. The Massachusetts Bay Transportation Authority is proposing to eliminate all weekend commuter rail service and tens of thousands of door-to-door rides for passengers with disabilities, part of a slate of cost-cutting moves meant to close a $42 million budget deficit. The proposed cuts, far more dramatic than many advocates expected, could potentially take effect in July and last for a year if they are approved by the agency’s fiscal and management control board, but officials have yet to present a clear timeline. Stephanie Pollack, the state’s transportation secretary, said sharp reductions are needed to balance the budget and invest more in other parts of the agency. She also indicated the agency is putting the idea forward to prompt a broad debate over the MBTA’s priorities. “We need to ask questions about what we want to run,” she said Monday. The scope of the proposal spurred swift opposition. Paul Regan, executive director of the MBTA Advisory Board, which represents the communities that receive MBTA service, urged officials to reconsider scuttling weekend commuter rail service. The board approved a preliminary budget for the next fiscal year, but made it clear the proposed service cuts are not a certainty. A final budget is due April 15. “At this point, I would not vote for this as a budget,” said Brian Lang, a board member. Under Governor Charlie Baker, the MBTA has adopted a number of unpopular changes taking aim at its chronic financial woes, including fare hikes and the elimination of late-night subway and bus service. But Monday’s proposals were more sweeping. Carolyn Villers, executive director of the Mass Senior Action Council, an advocacy group for senior citizens, said cutbacks to The Ride, the agency’s door-to-door service for disabled passengers, would have major ramifications. Mayor Martin J. Walsh said at a news conference that canceling weekend commuter rail service or trips for disabled riders would be difficult decisions, and that he had concerns. Eliminating weekend commuter rail service would save about $10 million, officials said, while reducing certain trips on The Ride would save $7.4 million. The MBTA is federally required to provide door-to-door service within certain areas around bus and subway stops, but currently provides, for a higher price, trips that go beyond those areas through The Ride. The MBTA proposal would eliminate trips that are three-fourths of a mile away from bus and subways stops, affecting areas in a dozen suburbs, including Concord, Topsfield, and Medfield. Cuts to The Ride would affect about 8,000 people and more than 200,000 trips, the MBTA estimated. The Ride’s expense has made it a frequent target of budget cuts. The board has met with advocates to study ways to reduce costs and recently implemented a program using Uber and Lyft rides to supplement service. 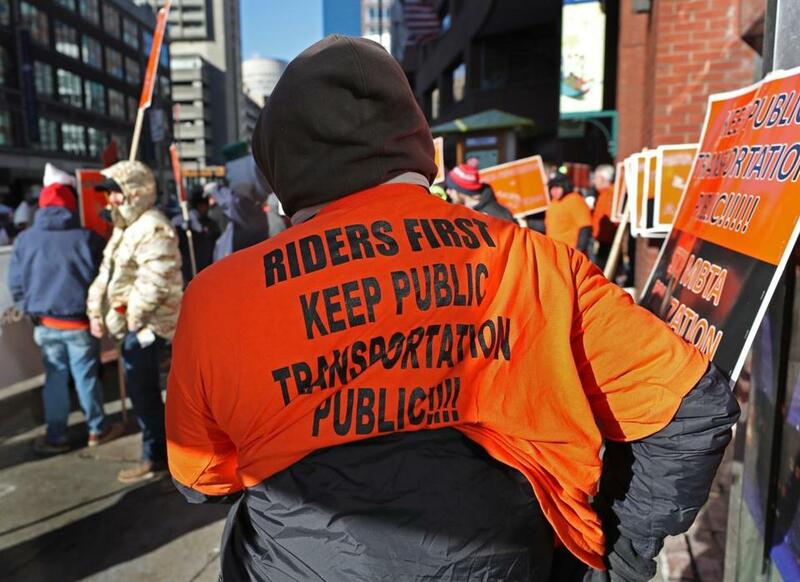 But MBTA officials say more cuts are necessary. Eliminating weekend commuter rail service would also affect thousands. According to May 2016 statistics from Keolis Commuter Services, the company that runs the commuter rail, trains provided about 8,300 trips heading toward Boston on Saturdays and 4,500 on Sundays. Keolis did not provide numbers on outbound trips in its report, but previous counts have shown significantly more passengers. During fiscal 2013, about 25,700 trips were recorded on Saturdays, and about 21,000 on Sundays. Bus mechanics protested outside the Transportation Building downtown. On Monday, MBTA officials also said they could save about $27.6 million by privatizing a number of the agency’s bus garages, forcing union workers to reduce spending at another garage, and converting a number of customer service agents to drivers. MBTA officials, including acting general manager Brian Shortsleeve, have said that such moves have been planned for months. Shortsleeve said that it was crucial for the MBTA to balance its budget without using additional state revenue. Officials have pointed to a 2015 law that requires the budget to be balanced primarily through cuts and increases in internal revenues, such as fare or advertising dollars. But critics have pointed to other areas of the budget that could be used to shrink the deficit, such as additional state revenue and a designated fund for repair projects that was established after the MBTA raised fares in 2016. That fund includes about $125 million, Shortsleeve said. Mela Miles, an organizer for the Greater Four Corners Action Coalition, a Dorchester advocacy group, said that fund should be used to avoid the proposed cuts.